For over a thousand years, dogs have been used to pull sleds, carry items and assist in hunting in the Nordic region. These dogs are usually huskies, due to the fact that they are the most eager and wiling to work. One thing that is very much associated with Norway is dog sledding. Not only is it a fast-growing, popular tourist activity, but it can also be a sport. In dog sled racing the sled dog teams usually consist of between 5 and 14 dogs, selected according to speed and stamina. Robert Sørlie is a champion dog sled racer and member of a famous dog-sledding team, Team Norway. 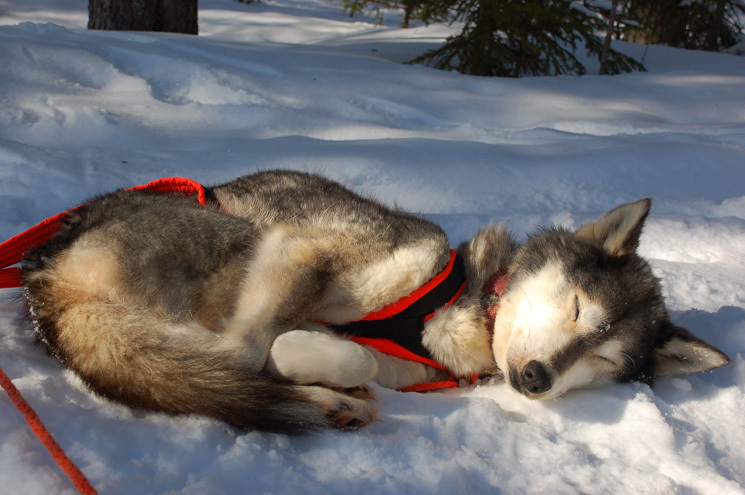 In 2003 Sørlie became very well known for winning the Iditarod Trail Sled Dog Race across Alaska. He is particularly well known for this due to the fact that he is the only non-American who has won this race. 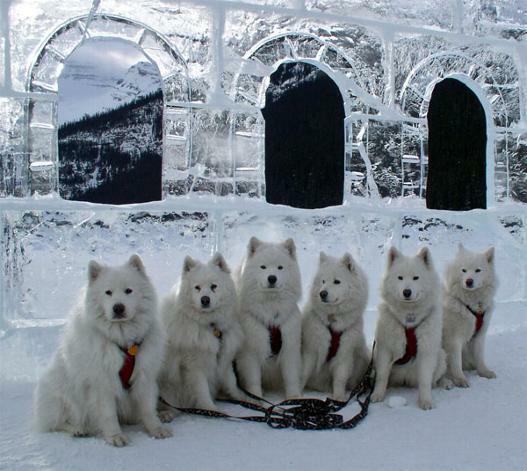 Another breed of dog used for pulling sleds are Samoyeds (pictured below). These have a long history and are believed to have originated in Siberia. The Samoyed people, otherwise known as the Sami, not only used the dogs for pulling their sleds, but for hunting, guarding property and for herding reindeer. They were even used for warmth, sleeping closely to their owners on cold nights! Have you ever tried dog sledding? I never have but it’s very high up on my wish list. A few of my friends have been, up in the northern Norwegian town of Tromsø. It is possible to take two-day trips, camping overnight out in the wilderness. Apparently on the overnight trips, the dogs dig little holes in the snow, side by side and curl up in them to keep warm! Adorable! I can’t think of a lovlier way to experience the Norwegian countryside than sitting back in a little sled and watching the breath-taking scenery whizz past! 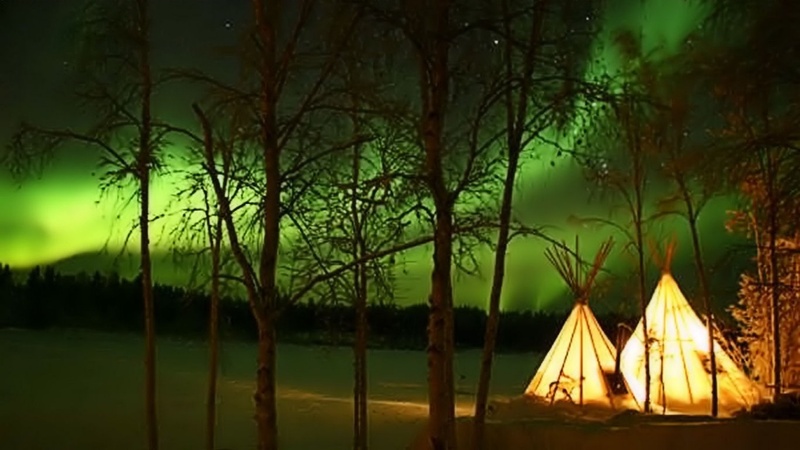 And imagine camping overnight in the snowy wilderness, watching the northern lights shimmering over-head! Idyllic! Ah, meant to say - the jewellery making friend I mentioned has posted on your jewellery making entry, just in case you miss it. 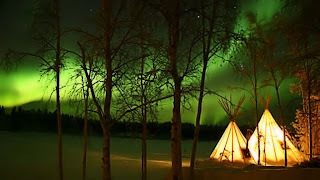 I've been trying to convince my husband that a nordic vacation involving dogsledding, a night in an igloo or ice hotel, and the northern lights would be amazing! But, he always seems to want to head South for vacation, lol. You have to persuade him! Just think how amazingly romantic it would be! Lovely post. It sounds like such a wonderful thing to do and can you image seeing the northern lights?! Wow now that would be an experience! Those Samoyed dogs are gorgeous. I know! I've seen photos of friends of mine gazing up at bright green swirly skies and it looks so incredible! I'm so jealous! Nikki--I would LOVE to dog sled. My hubby got to do it once and I was so jealous. :) We went to Alaska on a cruise about 4 years ago and for some reason it didn't work out to do the dog sledding. I love your photos! Aw...so adorable! I've never been dog-sledding but after reading your post, I'm putting it up with with gliding.. :D A lovely post! Some of my best friends had a pair of malamutes for years. They were the biggest, fluffiest, goof balls I've ever known. I loved them! One of my favorite breeds of dogs is the Alaskan Husky. Love them. Such an amazing dog. As for dog sledding...Well :) I can appreciate the beauty and challenge of the sport...but I'd rather cross country ski! 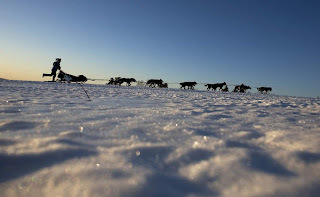 I recently read a bout by Andre jute about the Iditarod -- so fascinating. Those white dogs are gorgeous. I've never tried dog sledding, but I know it would be amazing. This is a great post! I live the pictures, especially the one of the Husky! Kiss, kiss, kiss, kiss all those doggies. Oooh they are so beautiful! A very informative post! Thanks for sharing. I love Huskies and Samoyeds; have owned both! They are the best dogs. I would love to have the experience of dog-sledding. Looks fun. 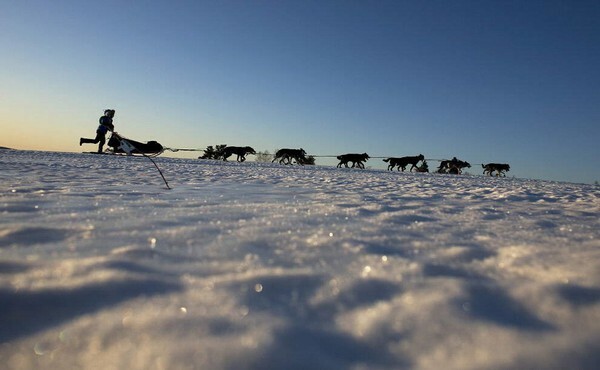 I've always been totally intriqued by the idea of dog sledding - though I've never done this. But, it seems romantic somehow & I love snow and the cold. It sounds like fun, but I'd want to huddle with the dogs. They are so darn adorable. Beautiful image choices, once again. Visiting from A/Z; such a cute post! I love Samoyeds, we had one a few years back, great dog! I have never tried dog sledding, but it does look like an adventure! I hope you get to do it some day! Enjoy the rest of the challenge! I've never thought about dogsledding. I should, though, because I love, love, love the snow. I love dogs, so this post really steals my heart. I have always thought Huskies were gorgeous and considered them as a breed to try having, but then did not think it would be fair to keep one in the climate of the Southeast United States. So instead I have two Shetland Sheepdogs and three Cavalier King Charles Spaniels. One of my Shelties thinks he should be a sled dog, though, with the way he pulls on a leash! He has pulled me on my tricycle before. I've always thought dog sledding was fascinating. There is a resort up in northern Minnesota that offers dog sledding camps, but it costs about $2,000 for the week and that's a little steep for my blood. Add it to the bucket list, I guess. I would like to go dog sledding one day. I've always wanted to teach my dog how to pull a sled--we usually have Malemutes as pets. Sounds like fun! Those dogs are all so adorable! They look so sweet, I want to play with them in the snow! I'vedreamweaver always loved the majesty of those dogs and admired what they do. Returning your visit :) I love everything nordic <3 and I would love to try dog sledding. But I have only been up north in the summer! I love stories about dog sledding. They are beautiful, hard-working teams. I know some people here who do dog sledding. I'll need to ask for a ride, demo, some day, next winter. I've never tried dog sledding, but my friend who has, says it's really cool. Love the picture with the aurora borealis! Very interesting post! My daughter had a Husky. He had the prettiest blue eyes and was a very strong dog. She had problems controlling him because she weighs about 110 lbs. and probably less back then. So she found him a new home. He sure was a beautiful dog tho. Enjoyed reading your post! I've always been taken by the relationships the dogs have to their master, and to each other. I can imagine that if you're in a really cold climate, it would be nice to have a dog that keeps you warm. That little dog asleep in the snow is so adorable! Aww, beautiful! I've never done it, but I'd love to try. I think I will add dog sledding to my bucket list...thank you for teaching me something new today! These dogs are such magnificent creatures, and I've always wanted to try it! I have heard it's pretty rugged and you really need to hold on with an iron grip! Your pictures are so wonderful. Your site is inciting my wanderlust. Dog sledding would be amazing to try! Have you ever heard of the term "three dog night?" It would be a very cold night indeed if you needed three dogs to keep you warm. It is also the name of a very successful singing group from the 70's! I hadn't heard that before. It would be very cold, but it would also be very snuggly! Every day you leave me with the most lovely fantasies; I can just feel my blood pressure dropping. Thank you. And glad you came back for my D; it should have been up by 8am, mot sure what happened...I'll be up tomorrow with E for....? Thank you very much :) I'm glad you like it! I love this post. I used to have a Siberian Huskey. Nicely done. The dogs are adorable. They are such wonderfu companions. Great article. Both those dogs are seen here in USA, in fact my neighbour down the street has a husky. WQe have a mixed breed dog Lucy whom we love. Love the dogs! Thank you for the article. When I took an Alaskan cruise years ago, I seem to recall a dog sledding excursion as one of the activities offered to the guests. Oh how I'd love to go on an Alaskan cruise, you lucky thing! The dog on the first photo is so cute! I love your post fro D. I have loved dog sledding since I saw the movie White Fang back in the day. I would like to see a read dog sledding race something in person. I am loving your theme better by the day. Those dogs are soooo adorable! We both blogged about dogs :) there's an amazing sled dog race here in MT. Very famous. I bought a sled dog ride for my dad and brother for Christmas one year. They loved it. I blogged about dogs yesterday; the photos are perfect, you can almost imagine the dogs' personalities looking at them. I so miss having a dog. I have never tried this, but it sure looks fun. The huskies are incredibly adorable, but like TMW Hickman said, they would not survive the Texas heat. resident a truly alluring abode to call home.